Thor happily munches away as I stroke his large velvety antlers. I’ve always wanted to pet a moose. Sweden has over 300,000 of them living in the wild. Thor is no longer a wild moose though. 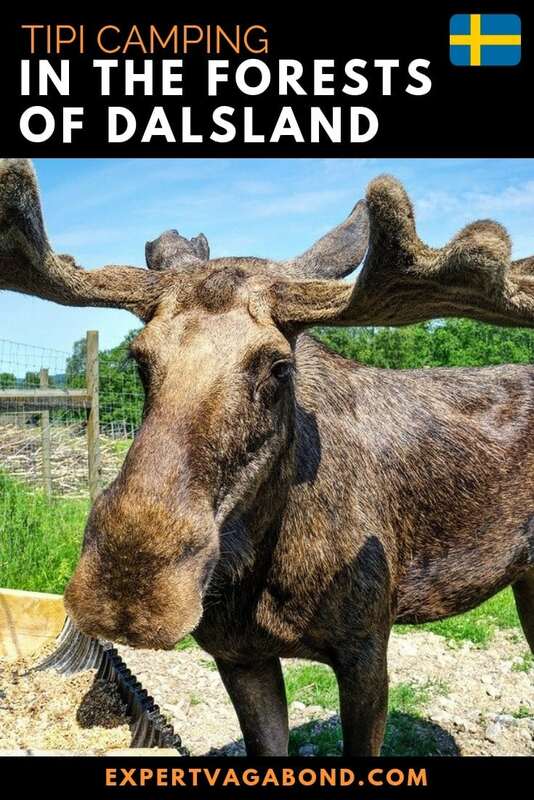 He’s one of seven now living at Dalslands Aktiviteter outdoor park in West Sweden. Pontus, the owner, adopted Thor 10 years ago after his mother was killed. 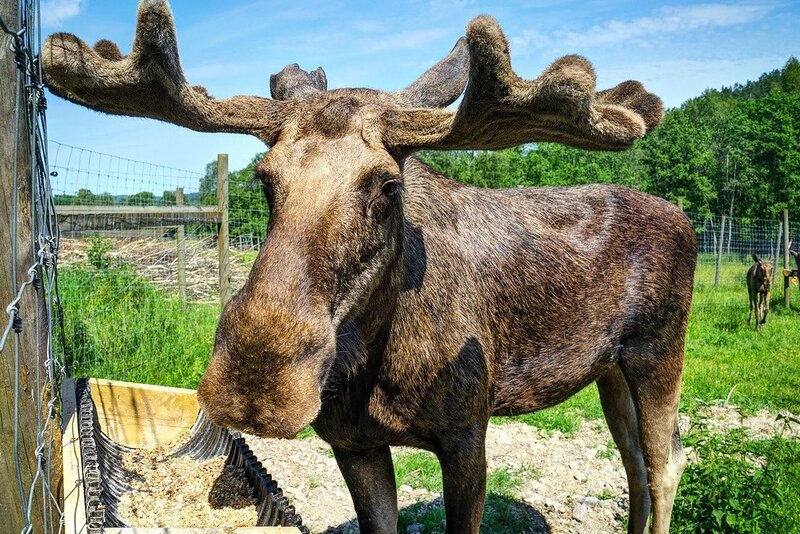 These days the moose park has grown, allowing visitors to learn more about these big goofy animals up close. I was driving through the Dalsland wilderness with Katie (the reader who won my blog contest) as part of our West Sweden road trip with Volvo. 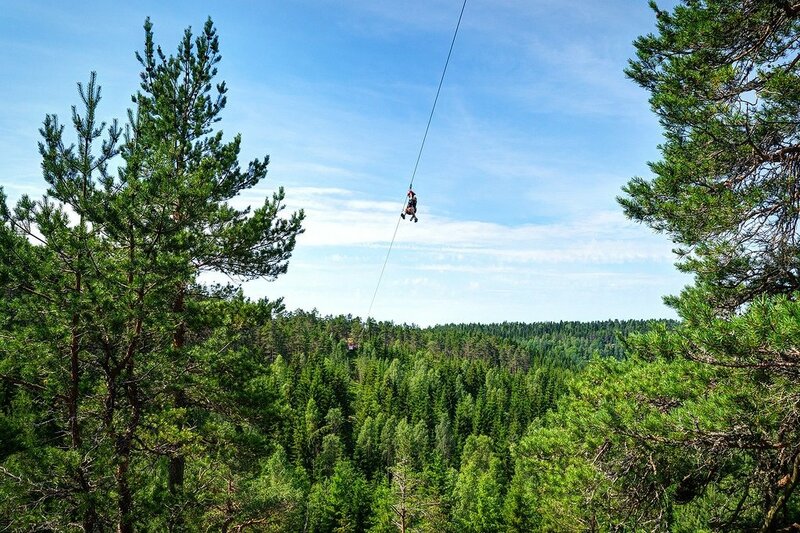 We’d stopped for a fun day of outdoor adventures, Swedish style. 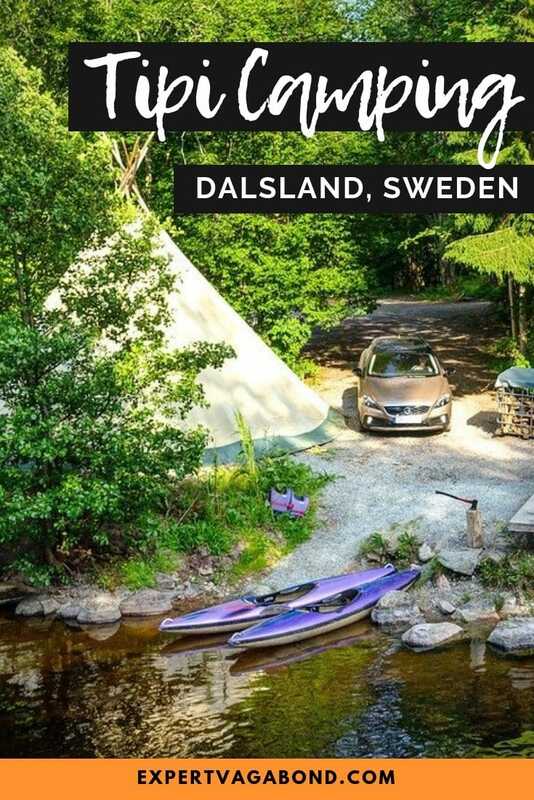 Dalsland is known for its dense old-growth forests and countless crystal clear lakes. The area is an outdoor lover’s paradise — a perfect landscape for enjoying activities like hiking, fishing, camping, mountain biking, canoeing, and more. After hanging out with Thor and his moose friends, we strapped on harnesses and went for a short hike into the woods. Our destination? A 600 meter long zipline over the trees. I’ve experience many ziplines during my travels. They are becoming a popular tourist attraction all over the world. Yet because Katie had never tried one, I was more excited to watch her give it a go! Zipline’s are pretty scary the first time. Placing your trust in equipment is sometimes easier said than done. Flying through the air hundreds of feet from the ground will make anyone nervous. But once you take that leap, the adrenaline rush kicks in, and you’re hooked. We drove down the road to a lake where we’d be spending the night camping. 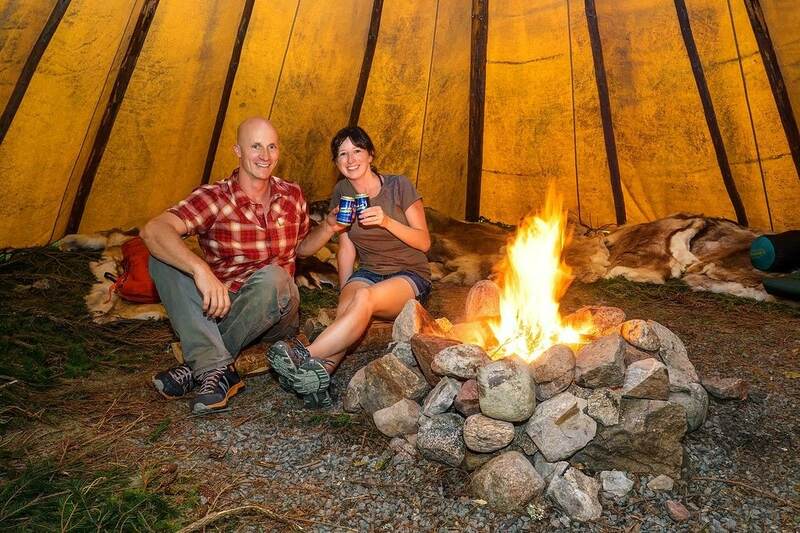 But it wasn’t your typical camping experience… we’d be sleeping in a tipi tent! Why a tipi? Well the Native Americans weren’t the only people to use them. An indigenous group in Scandinavia called the Sámi have their own version called a Lavvu. 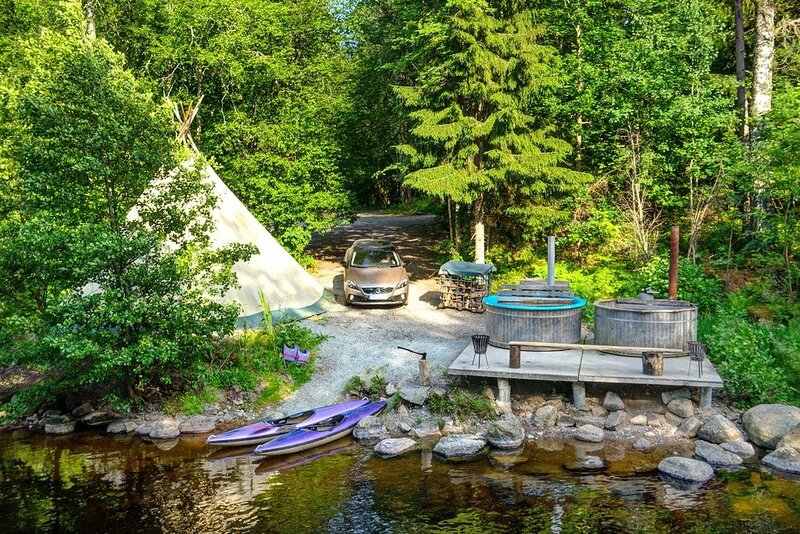 Our tipi camping adventure was part rustic, part luxurious. The beds were made of pine branches covered with soft reindeer hides, and to keep bugs away we lit a fire inside the tent. Smoke billows up through a hole in the top. A wood-fired hot tub on the edge of the water was perfect for unwinding at the end of the day. 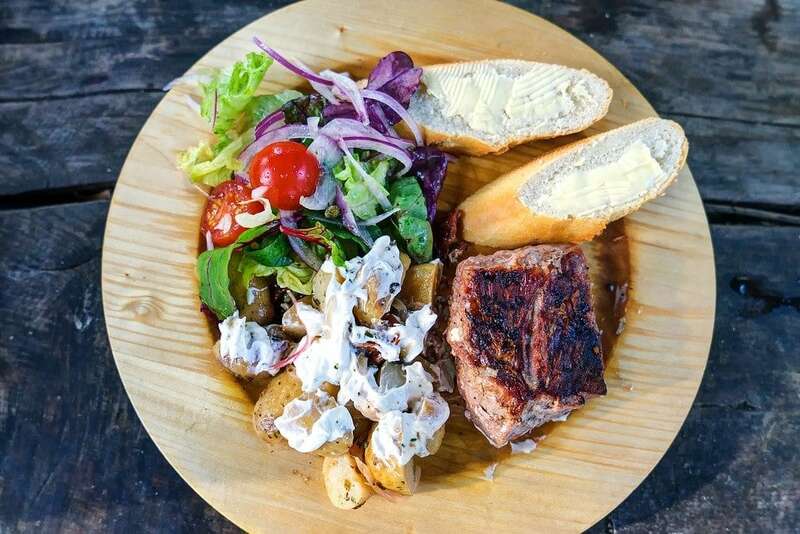 For dinner, grilled pork with potatoes & salad. To me, travel is more about the journey than the destination. It’s the little unexpected moments that happen along the way that make a trip particularly special. For example, a scenic road trip with a new friend. Or attempting to sleep outside in a land with 20 hours of daylight. Jumping into cold lake water followed by a scalding hot tub. Petting a giant moose. Hanging a hammock under the trees and napping to the sound of birds singing. Find cheap flights on Skyscanner. This is my favorite search engine to find deals on airlines. Also make sure to read how I find the cheapest flights. Discover Car Hire is a great site for comparing car prices to find the best deal. Booking.com is my favorite hotel search engine. Or rent apartments from locals on Airbnb. Read more about how I book cheap hotels online. Disclaimer: #WestSweden #InAVolvo is made possible in partnership with Volvo and the West Sweden Tourist Board. However all content & opinions are entirely my own. Wow Sweden looks amazing! I’ve never really had it on my must have places to go but you just changed that! Awesome Jordan! Sweden surprised me as well. Glad you want to visit now. What I like in your blog is, that you notice all these details too. Is Sweden as ridiculously expensive as Norway is? No, Norway is more expensive. Thanks Ian! Glad you’re enjoying it. I see Katie from Domestiphobia!! The experience looks amazing. Zip Lining is one of my favorite things to do on a nature trip. The scenery looks epic! Yup, that’s her! Road trips aren’t as fun by yourself, was glad to have her along! Tipi camping!?! We are going to be just that in 3 weeks in North Dakota. Those Margarita’s look tasty, never heard of them before. Any chance you will be in the US in the near future? We are heading out on our 4 month U.S. road trip in 3 weeks. Looks like you showed Katie a good time. Safe travels. No plans for the States anytime soon, but have fun! You can’t go wrong road tripping through America. So many great national parks to see. Looking forward to your photos! Amazing photos man! Love that moose photo. Zipline looks scary though. I once did zipline but it wasnt as high as this one. Yeah this one was pretty high up! Great views of the area though.